The Socialists will not give up the post of Parliament Speaker to "ACUM" block and insist on party leadership negotiations to create a Parliamentary majority. The statement was made by the President Igor Dodon, the informal leader of PSRM. The statement was made after yesterday the PAS chairman said the block "ACUM" still insists on the formation of a minority Government and has nothing to discuss with PSRM. "Then it will be never ACUM, because the requirements set by the Republican Council are very clear. We await the formal decision, not television commentaries on the proposal and the creation of a ruling coalition with a functional government, not a minority government. 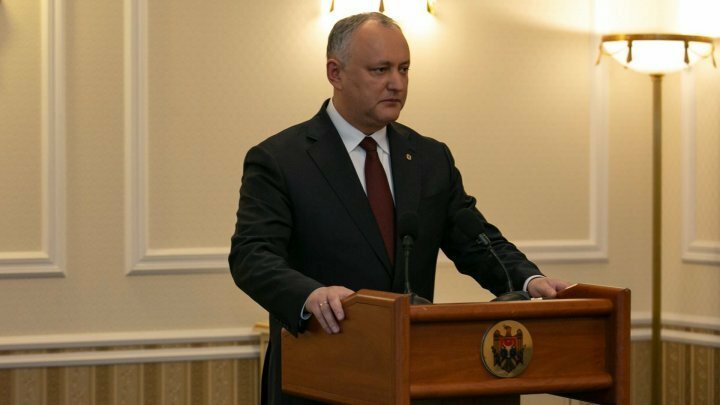 are ready to accept such a position, then prepare for anticipated Parliamentary elections", said Igor Dodon. In a TV show, Maia Sandu commented on the heads of state statements made on Friday after the PSRM Republican Council meeting. Then, Igor Dodon announced tougher conditions for the creation of the parliamentary majority with the political block ACUM and rejected the minority Government proposed by PAS and PPDA. Besides the office of Parliament Speaker for Zinaida Greceanii, and the leadership of the Ministries of Foreign Affairs and Defense, the Socialists appeal to the Minister of Interior and Deputy Prime Minister for Reintegration. Under these circumstances, Maia Sandu said she no longer sees the point of talks with the socialists. "I do not see what we can talk about, because we are talking about different things. They talk about a major coalition and try to make an abstraction that we are in different worlds", said Maia Sandu. On Thursday, talks between the PSRM and the PAS-PPDA binomial on Government-building failed. The few deputies from the three parties who participated in the consultations initiated by the socialists in Parliament have quarreled and finally broke up without finding any consensus. The leader of the PSRM parliamentary faction, Zinaida Greceanii, left before starting these discussions, angry that her counterparts Maia Sandu and Andrei Nastase did not come.